For established turf with bare or weakened, thinning areas caused by drought or traffic, overseeding is the best way to re-establish thick, healthy, more decease resistant turf. Professionals tend to dethatch and overseed at the same time. Dethatching first to remove any matted thatch. Doing both allows for the best possible penetration of seed and root establishment. 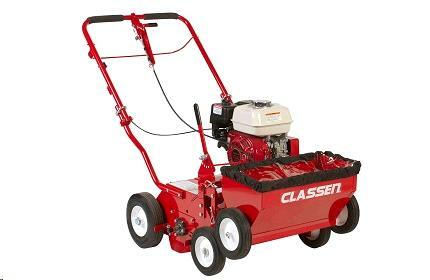 The Classen turf overseeder is a multipurpose machine for seeding a new lawn or overseeding an existing lawn. The front seed drop ensures follow-up soil coverage for better seed germination. The blades are designed with a cutting edge on both ends, which doubles blade life. Handles fold easily, for portability and storage. 13 double-bladed shafts, 26 blades in all, spaced a narrow 1.5 inches apart, provide carpet-like coverage. Covered metal seed box with metal seed paddle agitator improves the mixing and dispensing of seeds. * Please call us for any questions on our over seeder classen ts 20 rentals in Fort Madison IA, serving Southeastern Iowa and Western Illinois.